Korg MS-20 Mini an instant Classic! Hot in JAPAN! OH WOW! The Korg MS-20 mini I feel is going to be an instant classic. Yesterday I got a call that a Korg MS-20 mini was finally received in a music store near my house here in Japan. They said these things were selling really fast and so I decided to pick one up as I likely would never afford an original in good shape or in good working order. Even with the release of the MS-20 mini, people are understandably still trying to maximize their returns on the old original Korg MS-20. It’s amazing at how many are suddenly for sale here in Japan. I bought Korg MS-20 mini for $375 which is quite a bit less then nearly $1600 that I see some originals selling for in Tokyo. Are they exactly the same? Probably not, but the Korg MS-20 mini is good enough for me and simply an awesome synth. The mini size is really nice. Already I find the Korg MS-20 synth to be a bit awkward, but with the smaller mini size, it seems to be a better fit. I don’t particularly like the feel of the mini keys, but I realize you can’t get too picky with this synth. The keys are ok though and shouldn’t bother most people. Everything else seems to look and feel just fine. Having 10 cables come with the MS-20 mini is a huge plus. I also LOVE the midi input. Sequencing the Korg MS-20 mini is easy as pie now. I’m not sure about the USB connection or whether I’ll use it, but the Midi IN is great because I can quickly insert this into my midi rig and get some great bass lines instantly. The sales clerk at the music shop I bought the Korg MS-20 mini heard that it was selling like hotcakes in Japan. The stores were having trouble keeping inventory and many had to order them in order to fill customer demands. They have not seen a synth sell like this in some time according to the manager who has been around at the store I frequent for a while now. I really think the Korg MS-20 mini is going to become a staple in many synth rigs here in Japan. It’s really quite reasonably priced, easy to use, sounds fantastic, and is simply a cool looking synth. The fun factor on this synth is off the charts and I feel it’s a tremendous learning tool also for learning about synths and synthesis. I highly recommend the Korg MS-20 mini if you do not have one or can’t afford the original. It’s a killer synth and likely one that will continue the classic status of the original. Grab one while they are still available. They’re HOT in Japan! Well done Korg!!! Here’s one of the best videos I’ve found on showing the sounds and capabilities of the Korg MS-20 mini. Well I finally managed to score a Korg Polysix, albight it’s not in fully working order just yet. I have one voice chip that’s dead and a replacement is on the way. Other than that everything works 100% on it near as I can tell. It’s a wonderful synth and likely will become one of my favorites if not already. I found it on Ebay here in Japan from a good friend whom I purchase from quite frequently. I’m so glad I bought it from him because I know the Korg Polysix can have it’s share of problems and I didn’t want to spend a whole lot time dinging around with it. 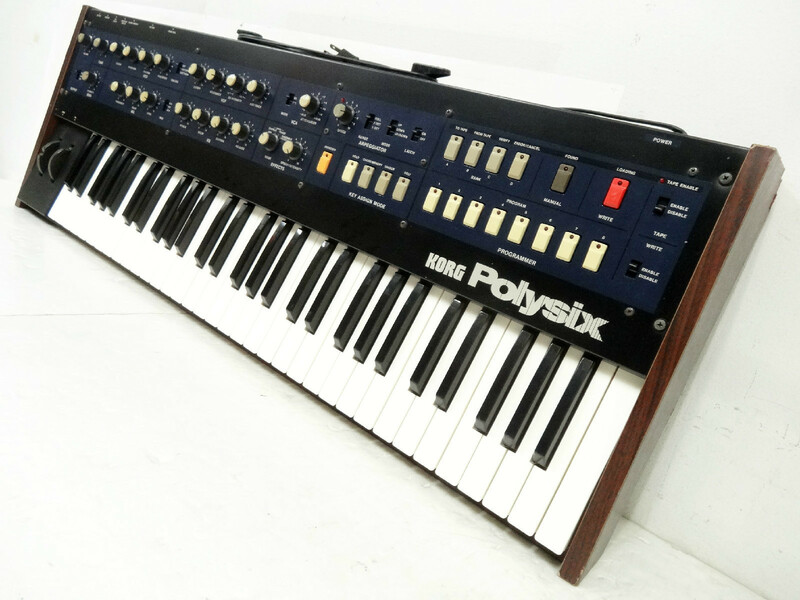 The Korg Polysix is one synth you want to get working right away so you can enjoy playing it. Cosmetically, the Korg Polysix looks fantastic. There are some slightly torn corners on the wooden panels which seems to be common, but other than that, this thing sure looks pretty…laugh. The two chips that are being replaced are the SSM2044 and SSM2056 IC chips. I also have a Korg Poly-61 which uses the SSM2056. It looks pretty easy to just pull the chips and add new ones. Likely some calibration will be needed after that, but it looks pretty straight forward. With testing I’ve determined the chips ( or one of them ) are the problem, so I’m anxious to get the new/used ones in there. I have a couple of 80’s retro shows coming up in August here in Japan and would love to add the old Korg Polysix to the mix. I was on the fence for a little while with the Korg Polysix because while owning the Korg Poly-61, I wasn’t quite sure if I needed the Polysix. However, after watching a few videos I found I really liked the rather unique sound of the Korg Polysix. It has a real gritty sound to it that I really like. It really slides in nicely with my Roland Juno-60. UPDATE: I replaced the SSM2044 chip and now it works fantastic! I had every 4th note skipping when played, so I just took out the 4th SSM2044 chip from the left. It started working great from there! Here is a great video showing you some of the sounds and capabilities of the Korg Polysix synthesizer.